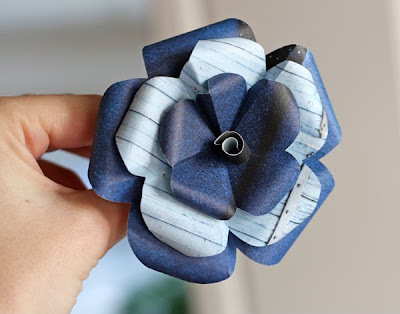 I learned to make paper flowers a long time ago with directions from a library book. 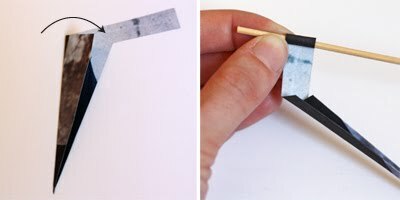 They don't require any adhesive, and there are just four shapes to cut out. Use them to decorate gifts or make wreaths. I chopped up a fancy Urban Outfitters catalog for these. 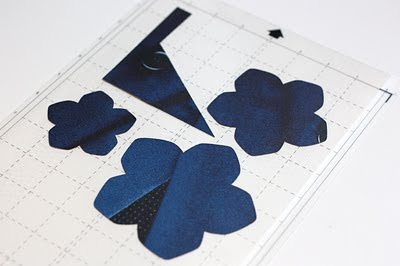 You can make template pieces to trace around and then cut out the shapes with a scissors—what I used to do. But this seemed like a good test for the Silhouette cutter, so I recreated the pattern pieces in Illustrator on my Mac and commanded the machine to cut them for me. It took about fifteen seconds to cut the parts for one flower. Whoa. I shall never return to my primitive, scissors-wielding caveman ways. If you'd like to download PDF templates, get the large flower here and the small flower here. To cut with a Silhouette machine, download a .dxf file here. (I exported it from Adobe Illustrator.) You should be able to open it and cut from Silhouette Studio. 1. Score the back of each petal along the lines shown in pencil, above. 2. Pleat the petals along the scored lines, always folding in the same direction. 3. Fold the triangle portion of the stem in half lengthwise. Do this two more times until it reminds you of a toothpick. 4. Using a chopstick or skewer, roll the "flag" portion of the stem toward the "toothpick." This curl will form the center of the flower. 5. Curl the ends of each petal backward to give them shape. 6. With a skewer or sharp pencil, poke a hole in the center of each flower piece. 7.Thread the pieces onto the stem, from smallest to largest. Finished! Come ON!! This is fantastic! Thanks for sharing. I love using old magazines for something cool. so much better than throwing them away! This is getting re-tweeted for sure! SO CUTE!!!! I wish I'd known this before my wedding...it might've changed how I did things (I made mine from quilting fabric instead)! wonderful tutorial!!! I have tons of magazines to work with... thank you! These are so neat! LOVE! Una idea muy buena para reciclar paginas de revistas. thats so cool! thanks! im gonna use it to decorate my dad's birthday gift! Aw, Man! I've gotta get me some Silhouette! Simply AMAZING! Thanks for sharing this with us! cool flower! That is great! very cute! love these flowers, am going to make some this weekend. thanks for so many great ideas. That's SOO COOL!!! Thanks for the tutorial. If you like, come visit the link party on my blog today. I would really love it if you'll add something. I just made one! The tutorial is fantastic! WOW this is so cool!! Super cute! I love how paper is so versatile and flexible that you can make these pretty flowers with it! Can't wait to use my new toy to make flowers! Thanks for the info and the pdfs of the patterns! just stumbled on your blog...what a treat!!!! 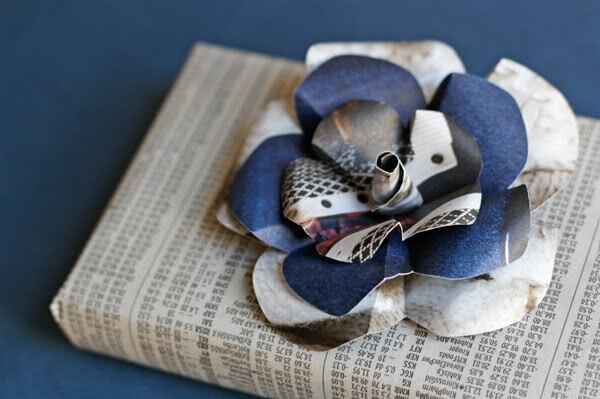 These are really cute...great way to use old paper and magazines! I might have to try some. Although I'll have to be old fashioned and cut mine out by hand! What a grand flower to make. I'll have to give it a try. Wow, this is very cool. I've already got a list of projects in my head! Such a cool idea!! Nowadays we've gotta recycle and what a fab way to do it!! Very cool and such a great time saver. These are great fun and just in time for Christmas decorations! These flowers are great. I think I will try a variation and maybe post soon :) Thanks for sharing. You rock! These are great. For those of us lucky enought to already have a silhouette (but not illustrator) can you attach the .studio file? I would, but I don't think there's a way I can make one for you! Know how to convert an Illustrator file to whatever format you need? this could be a great use of all those bridal magazines that i am hiding away(that are way too expensive to be magazines, lets be honest. This way- i can think of them as ore of an investment. So many brilliant inspirational ideas, thanks for sharing! i've already entered and i have my fingers crossed! love that machine! and this post.. is amazing cutting fabric and putting it on a onesie.. love! Just love these flowers! Made up some and took them to a very ill friend in the hospital. She enjoyed them as did her neighbor in the next bed. Thanks for helping to bring some cheer into her life! Love these flowers - thank you! i made some different looking flowers to put on top boxes. They were so much fun to make! Great idea will be having a go this evening..
Love Love Love this! Thank you so much for sharing! You are the best! 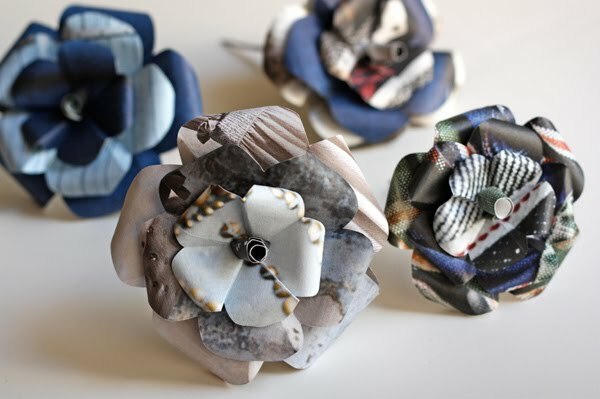 Thanks so much for showing us how to make these flowers! I gave a gift card as a birthday present, made one of these flowers then poked a small hole in the envelope & slid the stem in. The flower made for a beautiful presentation to a simple gift. thank you. I tried it myself. My flower didn't turn out as beautiful as your's. I think it's because of the paper's pattern, I will try another one. awesome. i love paper flowers so much i made my own wedding bouquet. which i'll be sharing on my blog soon. thanks for sharing. I just made my first flower...so cool thanks for this post!!! Now I'm going to be like addicted. These would look so cool on a wreath! Thanks for the tut! I made a bunch these over the weekend to use as gift toppers. Very easy! Great way to use an old calendar. Ugh, so sad I just gave away a TON of old Victoria magazines (from the 90's)! I love these flowers and will def be trying them, thanks for sharing! Too fantastic! I'm making paper flowers for my wedding, and NOW I'm inspired to make said flowers from all those bridal magazines! Thanks! This is nice. You can actually make one for your friend! Thanks for sharing this wonderful blog. I will try that at home. Great post! I'm getting married in 6 weeks...guess who's making these paper flowers!? THIS CHICK! Thank you sooo much! A couple of my girlfriends came over this weekend and helped me cut out a bunch of petals. I now have one bridesmaid bouquet finished and have started on my bouquet. Thank you for posting this tutorial!